This entertaining work analyzes the strengths and weaknesses of the Civil War’s top Union and Confederate generals using extensive primary documents and original research. Included are the surprising answers to intriguing questions: How did Union general Ulysses S. Grant attain such a high rank after numerous failures in civilian life? What made the dour, almost fanatically religious Stonewall Jackson perhaps the best combat leader in the Confederacy? Walsh’s record is a must read for history buffs from both sides of the Mason-Dixon! 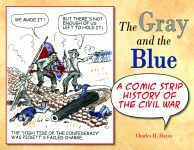 In an unusual treatment of Civil War history, author and cartoonist Charles H. Hayes provides original limericks and caricatures that introduce some of the most infamous, or unknown, historical figures of the war. His dry sense of humor and delightful wit illuminate such illustrious figures as Harriet Beecher Stowe, Roger B. Taney, Admiral David Glasgow Farragut, Robert E. Lee, Ulysses S. Grant, and many more who played a role in the War between the States. His catchy rhymes are well matched with clever sketches that play up the subjects’ foibles and follies as well as more admirable traits. Created in the style of pamphlets contemporary to the conflict, Hayes manages to convey fresh information with panache. For generations, the education system has taught a skewed Northern perspective of the Civil War in which brave Southern men are considered traitors and the Union Army saints. This resource about the War Between the States, written in comic-strip form, illustrates a Southerner’s perspective on the War, including Abraham Lincoln’s refusal to let the Southern states withdraw from the Union, which was their right according to the U.S. Constitution.